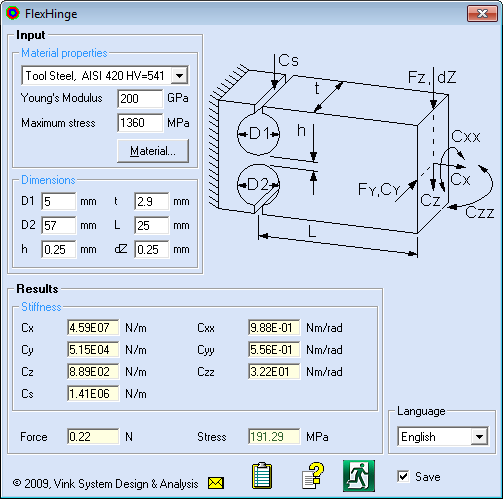 The free FlexHinge software application enables you to quickly calculate the stiffnesses and material stress of a flexure hinge. It carries out all calculations automatically. Simply fill in the material data and dimensions on a clearly laid-out window. The results will appear almost instantaneously. The latest release of FlexHinge is 1.0.3. See the release notes. Download FlexHinge here. Note: if you are running one of the toolkit programs on a high resolution display (High DPI) under Windows 10, the fonts can be blurry. See this article how to fix is easily. FlexHinge runs under Windows or under Linux using Wine. To install and run on Linux just follow these instructions. Required disk space is 0.2 MB. FlexHinge does not run under Apple OS. You can use the results from FlexHinge directly in your design decisions. Read more about about FlexHinge in the article Flexure hinges: theory and practice. You can download and use the flexure hinge calculator FlexHinge for free after registration. Via the registration, you will receive an e-mail when an update or new software is available. There are more than 1400 users of FlexHinge (May 2018). Please check the software programs about which you want to receive information. You will receive an email with a download link to the software. I am interested in your experience with HertzWin. Leave a comment below or send an e-mail.